Beyond the ornate facades and porcelain-tiled buildings admired by tourists, the colourful city of Porto is harbouring a secret architectural history. 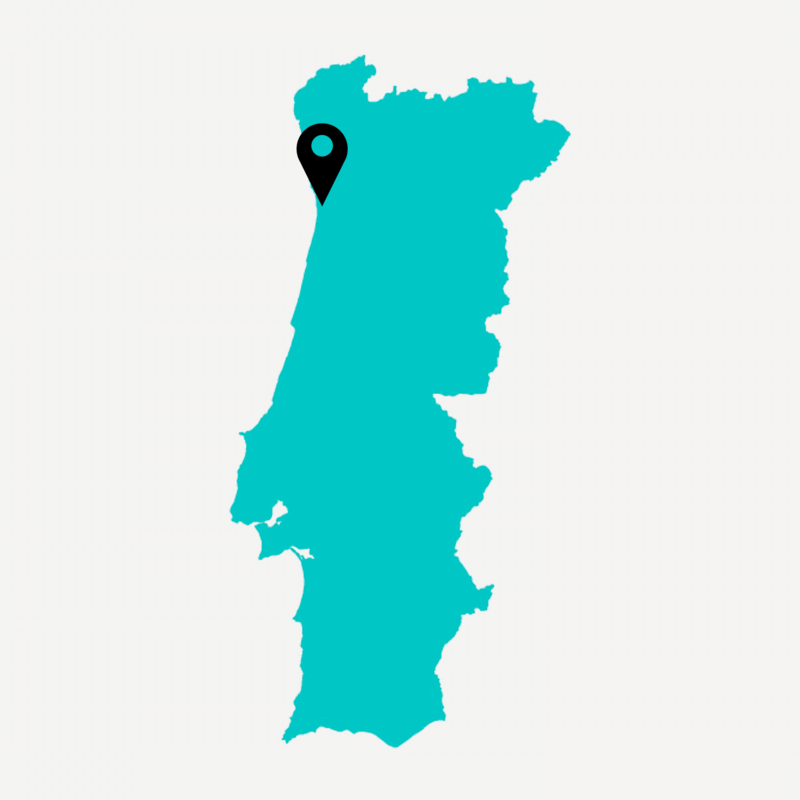 US journalist Peter Korn reveals the quiet truth behind the face of Portugal’s beautiful city. Historic Porto’s moment in the sun has arrived. 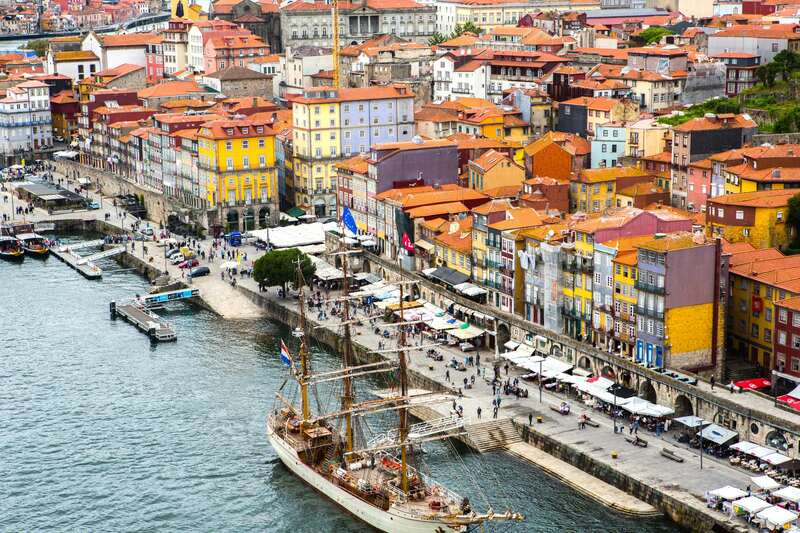 In recent years, Europe’s low-cost airlines have promoted direct weekend flights to Porto— on Portugal’s sunny northwest coast — with the result that tourist visitor numbers to the city have tripled in the last 10 years. Even in the off-season, swarms of travellers can be found strolling the wide plazas and sipping cappuccinos in the city’s numerous sidewalk cafés. Many visitors are drawn by boat tours of the Douro Valley where port wine originated and is still produced today. Families are attracted by the ocean beaches on the city’s west coast and the fact that Porto is a safe and good value destination. This rise in tourism is substantiated by the fact that a Hard Rock Cafe is set to open in downtown Porto in early 2017. Mostly, tourists are drawn to Porto’s remarkably well preserved city centre, with its beautiful ornate churches dating back to the late Middle Ages, neighbourhood streets with palatial 19th century homes, and row after row of apartment buildings decorated with hand-painted tiles. Its economic woes in recent decades have kept at bay the redevelopment that has turned many historic European city centres into collections of cheerless high-rise condominiums and office towers. One Porto resident who is embracing this rise in tourism is plucky Pedro Figueiredo. The energetic and engaging Figueiredo has turned his hand from designing buildings to leading tour groups for his unusually named tour company, The Worst Tours of Porto. Together with two fellow architects — who, like Figueiredo, found themselves out of work following the global financial crisis — he shows tourists around the abandoned buildings, old markets, and dilapidated areas of the city that are evidence of the hard times Porto has struggled through. What participants on Figueiredo’s Worst Tours learn is that many of Porto’s historic buildings are really just facades, fractions of buildings still standing because of Portugal’s strict preservation laws that forbid property owners from modifying or destroying the frontispieces of historic buildings. The result? Behind the beautiful facades lie nothing but ruins. Unable to finance maintenance work, and legally forbidden from demolishing their buildings, many impoverished property owners have been forced to watch their investments crumble bit by bit, leaving just their beautiful ‘faces’ intact. 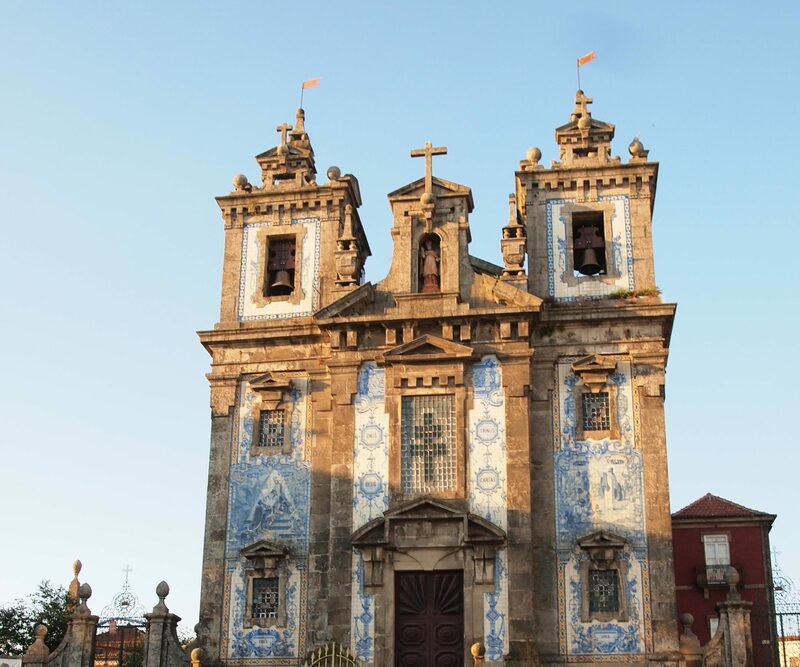 In fact, many Porto property owners have bequeathed their crumbling old buildings to the Catholic Church, or its offshoot social service agency Santa Casa da Misericórdia, hoping to “buy their way into heaven,” according to one local architect. Nearly one in five buildings in central Porto is vacant. Count the decrepit buildings that look one step away from abandonment and that figure could be as high as one in three, according to Figueiredo. Many Porto residents have been forced, reluctantly, to the city’s suburbs, where newer buildings with cheaper rents abound. The city has lost over 80,000 permanent residents over the last two decades. Why not restore the old buildings to their former glory and entice locals to return? Put simply, local people can ill afford the rents needed to recoup such huge costs. Today, the overwhelming majority of historic buildings that are being renovated are those funded by developers who are looking to turn them into apartments for the short-term, tourist rental market. So long as tourists are willing to pay 50-80 euros a night for an apartment, developers will focus solely on turning buildings into short-term rental warrens, Figueiredo explains. He doesn’t like it. “It’s hypocrisy,” he says, “because a building is like a person. They have a unity. They have an inside and an outside.” In his mind, a new building and an ancient facade never truly match. The architect in him isn’t buying the idea that chopping up historic homes and converting them to short-term tourist rentals is the city’s salvation. “It’s fake,” he says. The result of this boom in short-term holiday rentals is the creation of a historic city centre that could potentially become devoid of local people, culture and flavour — the creation of a ‘false’ city that is comprised solely of tourists and those who serve them. 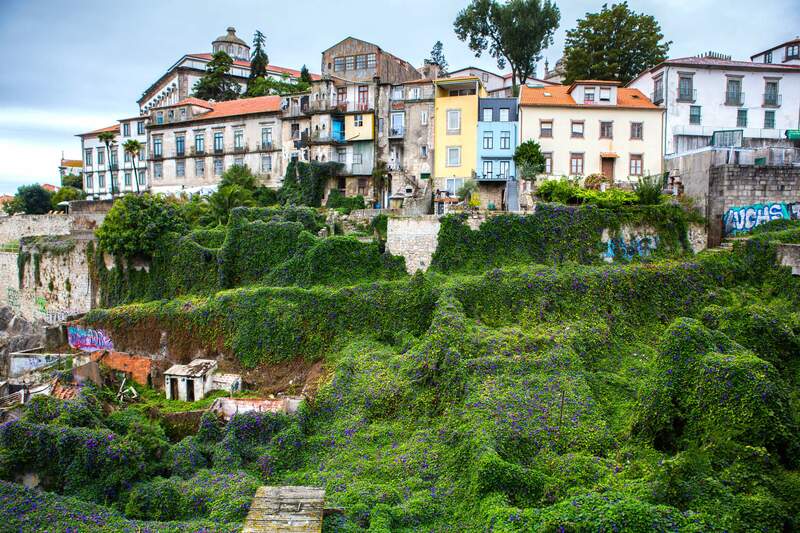 What doubly concerns Figueiredo and a number of Porto architects and urban planners is that the city may not be able to maintain its position as a desirable tourist destination in the face of increasing ruin alongside an increase in tourist-only accommodations. Tourists will begin to question whether the beautiful buildings they are admiring in the historic city are maintained for their benefit alone. So should the historic buildings of Porto crumble to dust rather than be restored for the pleasure of visiting tourists? Chamusca and others agree that if it were not for these short-term tourist rentals, the buildings would eventually disappear, meaning much of the character of Porto that attracts tourists in the first place would disappear with it. Porto architect Luis Sobral thinks we shouldn’t worry. Convert the apartments into tourist rentals and wait a generation. The tourist boom might end, and then local families can move back into the refurbished buildings. 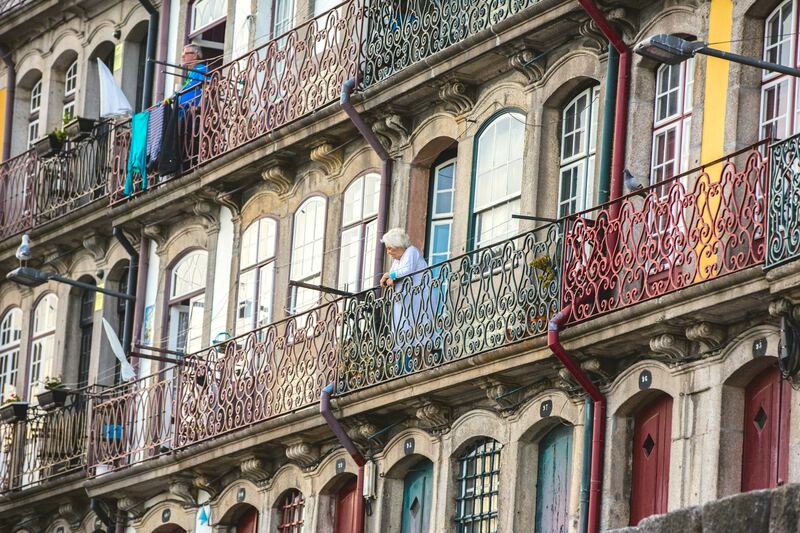 “It is very organic,” explains Sobral, who has bought and renovated one of those old Porto buildings himself, turning the second of three floors into tourist rental apartments. However, that scenario will only be possible if Porto immediately updates its municipal building code to ensure that apartments converted to tourist rentals are constructed to family living standards, explains architect Jose Lage, a University of Porto assistant professor. Lage believes most of the Airbnb conversions are being built with cheap walls, single-pane windows and exposed utility pipes that won’t suffice should families someday want to return to the city centre. And what about the overabundance of tourists? 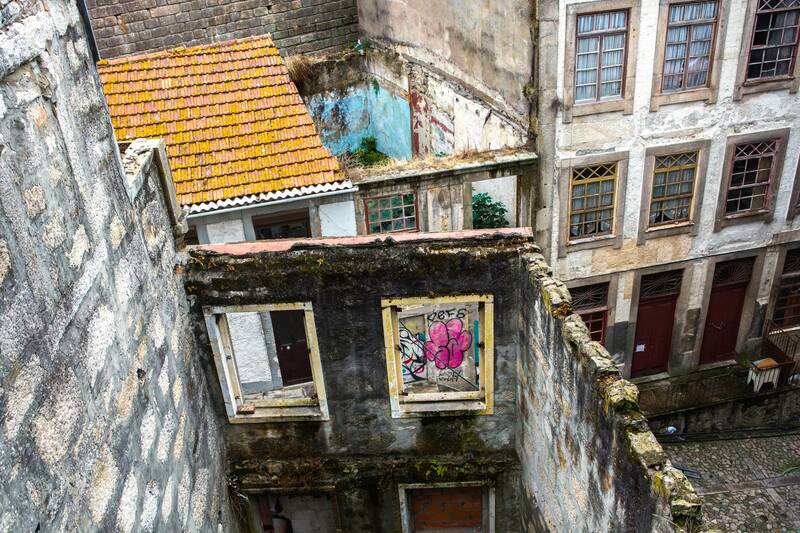 “There are still a lot of derelict buildings, so let them come and let them spend,” says city councillor Manuel Fernandes, the man in charge of Porto’s urban planning. Even as architects argue over the preservation of Porto’s buildings, a new form of art is gracing many of those same buildings. 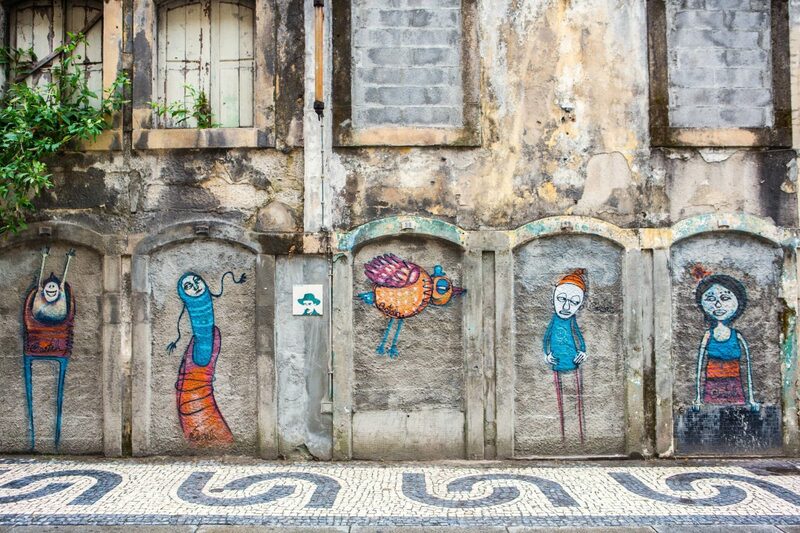 Since around 2000, Porto has been decorated with eye-opening street art, mostly on the walls of its abandoned buildings. Local artists have recently come together under the auspices of the Circus Network, a gallery and agency that helps them gain commissions from large companies wanting to adorn their exterior walls with beautiful, unique artwork. 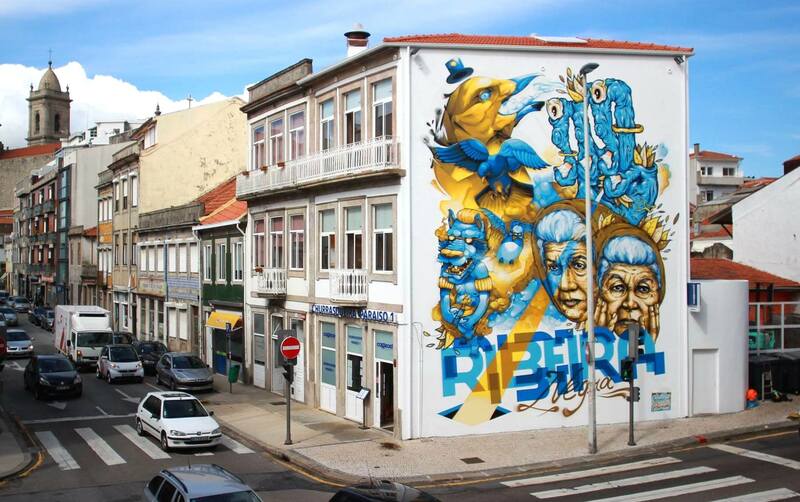 Which means in Porto, people can admire a piece of street graffiti and then purchase it on a T-shirt or as a poster. On his Worst Tours of Porto, architect Figueiredo revels in showing off what he calls ‘creative solutions’ to Porto’s architectural crisis and wealth inequality. The tour includes a visit to an abandoned shopping mall that has been turned into a series of music studios. Each of the mall’s hundred or so retail shops has been rented out at minimal cost to a different local band. As he leads his tour group around the ghostly, apparently abandoned mall, Figueiredo has his tourists put their ears next to papered- over plate glass storefronts. A metal band can be heard practicing in one shop, acoustic guitar riffs emanate from another. The Worst Tours of Porto aims to foster discussion on the value of urban preservation, and about what is being lost as one of Europe’s most stylish cities moves towards a head-on collision between economic austerity and tourism. As we have learned from Venice, sustainable tourism may be the only way to prevent our beloved historic cities from becoming two-dimensional spectacles.